Google announced a new service for businesses. Google My Business app for managing information relating to a trade or business. Available in a Mobile version and the web, the app can update contact information, suggest new photos or access statistics visibility. According to Google, "thanks to the Internet, a growing number of companies find new customers every day." But it would be more difficult for businesses to reach their customers online loyalty. "Our users are still complaining about the difficulties they face and the time they lose." The App aim to gather useful tools to ensure the presence of the company on Google. 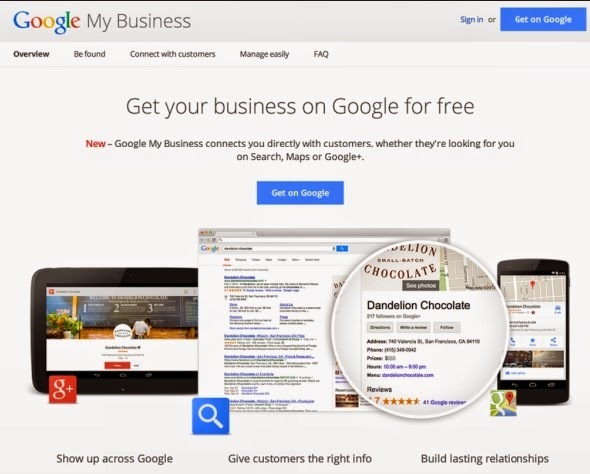 Google My Business allows to update information about the company so that it is visible on Google, Google Maps and Google +. Images can also be added, photos or virtual tour, it also provides access to reviews and allows to respond. It is also linked to Google +, to facilitate online access to news and statistics. Available in web version, Google My Business is available on smartphones and tablets running Android. An iOS version is also announced. Good to know: users already on Google+ Local or Google Places automatically benefit from all the features of Google My Business.